Norwegian Forest Cat breed information and advice. Norwegian Forest cat breed information and advice. Norwegian Forests are a delight to have around too. Affectionately nick-named 'Wegies' by breeders and owners, their handsome but inquisitive faces are always on the look-out to see what their humans are up to and will become your constant sidekick - they won't appreciate being left out of anything, even helping you with the washing! Adele Goff of the Norwegian Forest Cat Club adores these big-boned beauties: "They're a very sociable breed; they like to be with you all the time so if you want a cat who will just lie on the bed all day, choose a different breed! They like to be involved all the time and don't like to miss out on anything! They can be quite vocal and will chat to you with a chirp." Wegies are very adaptable and while they are happy as indoor cats, they also love all the fun of the outdoors and to be out in the fresh air. They love their toys too and will happily spend many hours chasing their favourite toys around. "They love to climb so if you live away from busy roads and have a nice big garden, they will love to be outside, but it is best for them to have access to an enclosed outdoor run if you live in a busy area," Adele advises. Naturally easy-going and placid, Norwegian Forest cats make excellent family cats as they are fine with dogs, being quite dog-like themselves, and are good with children as well. Not only that, they are known for being happy to be trained to walk on a lead - walkies with Wegies anyone? "We've sold a lot of kittens to families with dogs, and ours have always got on great with our dogs," says Adele, "They're also good with other cats too." In fact, they also make great companions for single people and are placid enough for elderly owners as well - so you could say that Norwegian Forest cats are cats for all households! One of the largest breeds in the fancy, Norwegian Forest cats certainly turn some heads with their large yet elegant builds and semi-longhaired coats. They have alert, expressive faces with wide eyes that can either be amber, green, yellow or blue. But the most eye-catching thing about the Wegie is of course their fluffy double coats which have water-resistant overcoats, a throwback to their origins living in the cold Scandinavian winters - not forgetting their magnificent tails and ruff around their neck. Wegies come in a huge variety of colours including black, brown, blue, cream and red as well as patterns including tabby, tortie, solid and smoke. The breed appeared in Norway in around 1,000AD courtesy of the Vikings but their origins date back further than that to Turkey, Spain, Africa and Russia. The breed adapted to the cold Scandinavian winters thanks to their thick, insulated, water-repellant overcoats. They were very popular amongst farmers and they were named as a breed in their own right in the 1930s but interest waned during World War II and the breed almost became extinct in the 1970s. Luckily the breed was revived by some very enthusiastic breeders and Norwegian Forest cats were established in the USA in 1979 and then in the UK in 1980 - being given GCCF Preliminary Status in 1990 and Championship Status in 1997. Nowegian Forest cat's plush coats are actually quite easy to maintain, a once-weekly grooming session is all that is needed to keep your Wegie looking his best, and as they love cuddles, this should be a relatively stress-free experience. 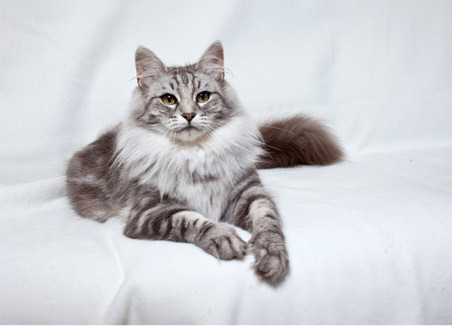 A healthy breed generally speaking, Norwegian Forest cats are not known to suffer from any inherited diseases although screening is offered to ensure that hypertrophic cardiomyopathy (HCM) is not present in the breed, as it is known to affect larger breeds of cat. As big-built cats, care must also be taken by owners to ensure their Norwegian maintains a healthy weight by offering a healthy diet - another advantage of offering outdoor access for your Wegie is that they will get plenty of exercise. Expect to pay between £400 to £500 for a pet quality Wegie kitten, but this will depend on location and also whether or not the kitten has been neutered and/or vaccinated. When you visit the breeder, ensure that the mother is present and the kittens look visibly healthy - look for bright-eyed, lively, inquisitive kittens who have soft, fluffy, matt-free coats and clear eyes and ears free of infection.